The story of Play-Doh began when Kutol, a Cincinnati based soap company, was about to go under in the late 1920s. Cleo McVicker, just 21 years old, was tasked with selling off the company’s remaining assets, which at the time comprised mainly of powdered hand soap. Once that was done, the company would be too. Cleo, however, managed to turn a nice profit in performing his task, the result of which was that the company managed to barely stay afloat. Cleo then hired his brother, Noah, and they set about trying to make the company viable again. In a bold stroke, Cleo told them he could make the wallpaper cleaner for them (even though no-one at Kutol knew how just then). Kroger subsequently ordered 15,000 cases of wallpaper cleaner from Kutol with a $5,000 penalty (about $90,000 today) if Kutol didn’t deliver on time. This penalty was more than Kutol had available to pay if they failed. Luckily for the brothers, Noah McVicker was able to figure out how to make wallpaper cleaner using a version of a then common formula for it. Unfortunately for the brothers, though, while this provided the staple income for their company for about a decade, after WWII, sales began to dwindle with coal heat slowly being replaced by oil and gas furnaces. These furnaces obviously didn’t produce the same type of soot issue that burning coal did, so cleaning wallpaper regularly wasn’t something that was needed anymore. Sales further dissipated shortly thereafter when vinyl wallpaper became available. This type of wallpaper could be cleaned with nothing but soap and water, so the McVicker’s product was now virtually obsolete. To make matters worse, Cleo McVicker died in a plane crash in 1949 and Joe McVicker, Noah McVicker’s nephew who was hired to replace Cleo, found out he had a rare form of cancer at the age of 25 and wasn’t expected to survive. However, he did, in fact, survive thanks to a new experimental radiation treatment. Although, even after treatment, the doctors deemed it unsuccessful and told him he would die shortly (in reality he didn’t die until 1992, though his ending was pretty sad all the same, see the Bonus Facts below for more). Joe decided to re-christen the compound which would now be a toy: “Kutol’s Rainbow Modeling Compound”. Enter Kay Zufall to once again save the day, assuring him that this was a horrible name for their product. She and her husband, Bob, then set about trying to think up a better one. In the course of their discussions, Kay came up with “Play-Doh”, which they both loved and suggested the name to Joe, who also liked it. Thanks to some connections to school board members formed from selling soap, the company initially sold their new product to schools all throughout Cincinnati. They then began trying to market it to stores, with only a marginal amount of success locally. While at this point it had saved the company, without money for major advertising, Play-Doh seemed to be destined for very slow growth- at least until Joe McVicker managed to talk his way into an audience with Bob Keeshan, better known as Captain Kangaroo. He showed Keeshan the Play-Doh and explained to him that Kutol had no money for a national advertising campaign nor money to have the product put on the show. However, if Keeshan would agree to use the product once a week on Captain Kangaroo, they’d give the Captain Kangaroo production company 2% of the sales generated, so long as he continued to show it. The Captain agreed and Play-Doh quickly became a national hit, even appearing on other children’s shows thanks to the Captain Kangaroo exposure. Further, even though they still sold the wallpaper compound for 34 cents per can, they were able to get $1.50 per can of Play-Doh despite the fact that the cans contained the same amount of the compound and the two products were virtually identical, save the cleaning compound was white and had a small amount of detergent added. Who Invented the Cardboard Box? Joe McVicker’s marketing brilliance apparently didn’t extend to other matters of business. Within a few years of Play-Doh’s debut, with the company grossing $3 million per year off it (about $26 million today), with a large percentage of that being profit and sales still rising at an extremely rapid rate as they began to expand to other countries, he agreed to sell “Rainbow Crafts”, which was the subsidiary of Kutol that made Play-Doh, for just $3 million to General Mills. Because the company was annually grossing that amount already and was still growing, this was viewed as a huge mistake by his employees, who tried to raise the money to out-bid General Mills, but failed. His former partner, Bill Rhoedenbaugh, also tried to convince him what a mistake the sale would be, but Joe didn’t listen to him either. A mere eight years after the sale, Play-Doh had grown to a global children’s toy staple and shipped its 500 millionth can at that $1.50 per can price. Joe McVicker ultimately squandered the $3 million he made in the sale of Rainbow Crafts and Play-Doh and died basically broke in 1992. Rhoedenbaugh no longer had any say in the matter of the sale of Rainbow Crafts and Play-Doh as he had been forced out by McVicker, with Rhoedenbaugh ending up with the struggling Kutol while McVicker got Rainbow Crafts after all the business maneuvering was said and done. It was at this time that McVicker filed the patent for Play-Doh, listing only himself and his uncle Noah McVicker as the creators, even though there were apparently around six total people that helped create it, including Rhoedenbaugh and Dr. Tien Liu. On the bright side, despite the fact that Kutol itself, without Play-Doh, was still struggling, Rhoedenbaugh managed to turn it around and today it’s one of the largest industrial and institutional hand soap manufacturers in the world. Rhoedenbaugh eventually retired, leaving the thriving company to his sons. Kay and her husband Bob, who is a doctor, run a clinic for the poor. The clinic gets around 12,000 patients a year, cared for by around 20 volunteer doctors, including Bob. The clinic is in Dover, New Jersey. The Play-Doh formula was somewhat refined in the late 1950s by chemist Dr. Tien Liu, to make it so that it wouldn’t dry out as quickly as the original wallpaper cleaner formula. His tweaks to the ingredients also made it so it wouldn’t turn white after drying out, which it did in the original formula. 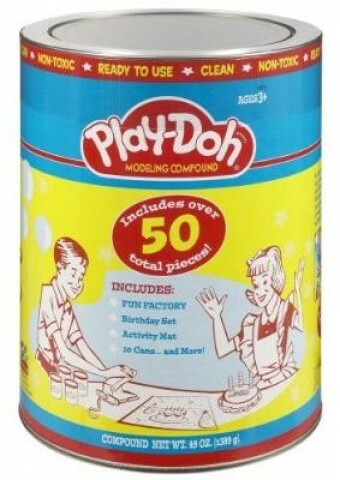 The original Play-Doh came in one gallon cans, in colors of red, blue, and yellow. They sold it in such large amounts per container because they felt their best bet was to sell it to schools, rather than try to sell it to home consumers. 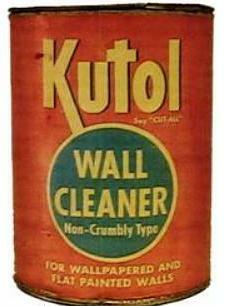 The wallpaper compound that would eventually become Play-Doh was actually quite common before Kutol started making it. The proportions were different, depending on who you talked to, but the basic recipe was known by many a home-maker, which is how Noah McVicker learned how to make it in the first place. When it was released, Play-Doh had the huge advantage over popular modeling clay of the day in that it didn’t stain, like modeling clay did. You might read certain places that Play-Doh was originally sold under the name “Magic Clay”, but this is not true. It was Play-Doh from the beginning. Play-Doh was purchased from General Mills by the Tonka Corporation and later bought by Hasbro, who still owns it today. Hasbro says that Play-Doh is primarily made of wheat flour, salt, and water. Other ingredients include preservatives, petroleum additives (to improve the texture), and borax, to prevent mold from growing on it. Due to the extremely high amounts of salt in the compound, it is important not to let animals (or kids) eat Play-Doh. The amount of salt is high enough per unit volume that, if they ate enough of it to fill their stomachs (which isn’t so much a risk with kids as it is dogs), their sodium levels could rise to very dangerous, possibly even fatal, levels. Today, an average of nearly 100 million cans of Play-Doh are sold annually. does anyone know the name of the original wallpaper cleaner?? The original names were, Kutol, Cincy, and Big K .
Norm McVicker (Noah McVicker’ s son). I worked at Kutol and Rainbow Crafts from1957 thru 1969. National play-doh day is actually September 16. Wow well you have a few facts right however your facts seem to be all coming from one source. And very opinionated. As the great grandaughter of Noah McVicker and the child of his oldest granddaughter who was amongst the first children to ever play with the constantly changing compound until it was deemed fit to ever enter a school building I have heard this story in a completly different way. Have you even tried to get facts from every side or just the ones who pout about not having their name on the on inventors list? The play doh compound was already being tested and Kay was simply asked to try it in her classroom. My aunts and uncles (his grandchildren) used to want to play with the stuff and that is when the idea came to NOAH MCVICKER to take out the toxins. Noah McVicker was my father. He was born on June 6, l904, in Manheim, W.Va. Work, as a child on the railroad, later in the coal mines in W.Va. Came to Cincinnati in the l920’s and worked for the Kroger Company using dough mixers to make bread. Joined his brother and they purchased an industrial hand soap company. After Rainbow Crafts was sold to General Mills he retired and died at age 76. He quit school at an early age and self educated himself. My daughter is doing a report on Joseph McVicker and Noah McVicker. Do you have any information at all on their lives? We can’t find very much information at all. Any help would be greatly appreciated! I would be interested in any info you have, as our family has a whole different story on the beginning of Play-Doh. Originally named Doo-Clay, created by Ben-Hi Co, original ads my family are actually in the ads and we do have original documentation and the original ads. The Company was Benjamin Robbins and Hi Robbins, Doo-Clay was created accidentally, as they worked with polymers, plastics, compounds, etc.. Under bad advice from one of their other brothers (Obviously) were told to sell the product and under the contract of sale, new company was NOT to keep the name Doo-Clay. The new company renamed it Play-Doh. My Great Grandfather and his brother at one point may have been in OH, I am trying to get more on that.. My grandmother has a lot of this stuff, but she is not on the computer, and on the other side of the country now. Ads with my Mother, grand-parents and uncle were from 1940’s, and the one I have a pic of now, my Mom says is a 1951-1953 ad, and was when they lived in the Pocono Mountains, Pennsylvania- but also traveled back and forth to NYC regularly. Unfortunately, I do not have a way to attach that ad here.. But I would love to know what kind of info you have.. I am thinking my family sold Doo-Clay to Kutol? That time-line sounds about right. I would love to get some more info, as the stories I am seeing, do not coincide w/ what our family has. If you would like to email me, I can get you some of the original ads..
My name is Norm McVicker. My father was Noah McVicker.Play-Doh was never called Doo-Clay Originated in Cincinnati,Ohio by a company called Kutol Products. (They produced wallpaper cleaner from 1933 through 1955. Started producing Play-doh in 1955. First sold in three basic colors, Red, Yellow, and Blue. Made from three basic ingredients Flour, Salt, a mixture of borax and alum. I had joined Queen City Founders Toastmasters where I met Joe McVicker, about 1970, a current member. I was one of a small group at Joe’s home near Galbraith & Miami streets in Sycamore Township, Hamilton Co, OH when I heard of his Play-Doh connection. These were a very impressing group I had joined. Seems this part of the Toastmasters history lost in the past. I conclude with your view, though I maybe basis.